If you ask people to draw up a list of the equipment they think important to take with them on a winter journey or on a winter camping trip, particularly in the northern forest, they might state an axe for felling dead standing wood for firewood. They might also state a saw for sawing up that firewood into manageable lengths, particularly if they are using a stove in combination with a heated tent. They might also list an ice auger or an ice chisel for cutting through the ice on frozen lakes and frozen rivers, either for accessing drinking water or for fishing. Fewer people, though, will say a snow shovel is high up on the list. In fact, a shovel is probably one of the most important pieces of equipment you can take with you. Yet is seems to be one of the most undervalued. In the above video I talk about this important winter tool that is often overlooked or undervalued for winter camping and winter travel. I also discuss several features I think are worth looking for in a good snow shovel. When you are winter camping, you find yourself using a snow shovel for all sorts of daily tasks. When you are setting up camp, you may be digging out a cold well, you may be putting snow on the snow valances of your tent to seal it, you may be digging out a latrine. You may be collecting snow so that you can melt it for your water supply. All these things are made easier, or possible even, with a snow shovel. When you go down to a river or lake for ice fishing, first you need to remove snow that’s on the surface in the area that you are going to be fishing, before you start drilling through the ice. A snow shovel allows you to move significant amounts of snow quickly and efficiently. This ability to move snow is always useful. You could be stopped for lunch, you might want to clear an area quickly so that you can have a fire and stay warm or, maybe, cook a bit of food. That’s always pleasant, particularly in the Spring. You may, however, face more difficult circumstances. For example, your snow scooter may have become stuck and need you need to dig it out. In more extreme circumstances – perhaps in which you are lost or stranded – you might need to dig down to the ground for an emergency bivouac or you might need to pile up snow to create an emergency snow shelter. Without a snow shovel, all of these things become extremely difficult. 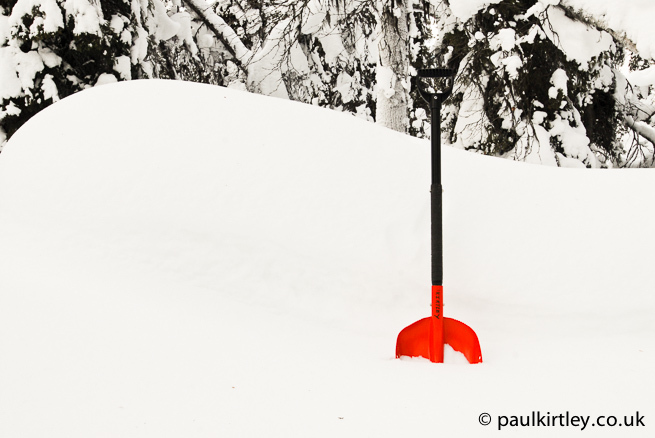 A good snow shovel is an important part of your winter camping equipment. Photo: Paul Kirtley. So, what to look for in a good snow shovel? First off, an extendable handle is very important. This gives you extra reach and allows you to move snow much more efficiently. There is a real knack to moving soft snow quickly and efficiently – it’s more scooping and less digging. As you can see, with a long handle, that scooping motion is made much easier. And it’s much easier on your back! Of course, you might be thinking, why not just take a long-handled shovel? First, this would be harder to pack. Also, if you did need to dig out a quinzee or snow cave, it’s a much harder job digging out the shelter with a long handled shovel, as it will be very awkward to work with in such a confined space. What else do I look for in a good shovel? Well, a good, strong metal blade. That’s going to last you a lot longer. Plastic blades may be lighter but in cold conditions, they become more brittle. I’ve certainly seen a fair few plastic shovel blades break over the years. Next, a good strong handle, a good strong shaft, and a D-shaped handle if possible. Handles of this type are becoming harder to find these days. You see a lot with a T-grip but the D-grip is really good because you can use them not just with gloves but also with mittens. Another useful feature to look for in any snow shovel is a removable head, so that you can separate the handle and shaft from the head. That makes it much easier to pack. Whether you are packing it in a backpack or on top of a pulk or a toboggan, a shovel which breaks down in this way makes it much easier to stow. The downside of course is that you have to be careful not to lose any parts, particularly the spring-clips which typically hold the parts together when joined. As a final tip – and this may require a little bit of customisation on your part – think about points of contact between you and the shovel. Metal conducts heat away much faster than plastic or wood. A lot of metal shovels are made from aluminium alloy, which is very conductive. In cold conditions, even with gloves on, you don’t really want to be handling metal because it will sap heat away from your extremities much more quickly than touching something less conductive. Most modern shovels have a metal shaft. Even if this is painted it will feel very cold. As you can see in the video, what I have done is wrapped some tape around the shaft of the snow shovel. I used hockey tape – the type of tape you wrap around ice hockey stick handles. You can buy hockey tape in many sports shops. It’s quite easy to get hold of. It is quite insulating and stops the heat being sapped from your hands. So, this is an excellent addition to make to your snow shovel. Again in the video, you can see that I’ve added it all the way along the area where my hands might be gripping the shovel. I hope this article and video highlights why a snow shovel is one of the most important tools you can take with you on a winter camping trip or winter journey. I also hope I have provided some useful pointers in what to look for in a good snow shovel. I like the Finnish company Fiskar’s compact shovels. 71 x 25.5 cm, weighs 800 grammes and costs about £12 here in Sweden. Great video, and good article, I was always advised to use plastic with wooden handle, purely for comfort and weight, but after seeing you modify your metal shaft with hockey tape, It makes for a much more durable and certainly when packing, a more compact option for bushcraft. Genius! Gonna have to look out for one of those! Good stuff Cyril. You’re very welcome. Check out the Voile models mentioned elsewhere in this thread. Addition: No, the Fiskars does not have an extendible handle, but it is build like a tank and won’t break even if you drive your car over it. I have tried several shovels with telescope or extendible handles and they have all been retired in the dumpster for scrap metal at the local garbage station. Thanks for your comment. Yes, I have used one of the Fiskars model – it is solidly build and much better than the Fiskars model with the ball handle – as soon you get a little bit of ice on your palm, you cannot grip it properly. I do quite a bit of backcountry skiing and carry two shovels. My other shovel is an avalanche shovel I carry in the rucksack for day trips away from my base camp. It’s compact and collapsible. The obvious use is to dig someone out if there is an avalanche, but I also could use it if I’m somehow forced into an emergency bivouac while out skiing away from the base camp. Ski hard, stay warm and keep the wind at your back! Thank your for your great comment. I like the idea of carrying a shovel blade and some screws when travelling in country where you have access to matierals to make a handle. I’ve seen people do similar with ice chisels. Thanks for the winter camping parenting tip too – I’m sure these words of warning will come in handy to many readers. Another good video Paul. Where did you get your snow shovel? This was a replacement for the one that my customer broke but I believe I bought the original one from Needle Sports in Keswick, Cumbria. I’m not sure if Black Diamond still make this model. I know Voile make some similar snow shovels. A shovel is standard carry here in the Winter, for all the reasons mentioned plus more. I have carried one for more years than I care to remember. You would be hard to find a snowmobile (our transportation of choice here in N Ontario) that doesn’t have one bungeed to it. Mine is an MEC Avalanche model give to me by my son many years ago. It has a L shaped handle which allows use with mitts or gloves. Hey Murray, good to hear from you. Thanks for your comment. Good article. I have a shovel that I believe was made by the same company as yours but a bit smaller. Do you happen to know why they put those holes in the shovel blade? I’ve always wondered if there is a specific reason. Yes, I had a slightly smaller one too – is yours orange? The one I had was I think a better overall shovel than this big red one because even though it was slightly smaller, it had a very shallow V-shaped edge to the blade which cut through compacted snow like a knife through butter – great for digging out snow holes and quinzees. Unfortunately I lent it to a customer on a trip to dig a snow pit and she lent it to another customer who used it to smash dead branches that were out of reach off a spruce trees (he was just being lazy rather than walking further to find kindling that was withing reach). He must have been hitting some sizeable branches as he completely beat up the sides of the shovel blade. I was doubly mad because even at that point they had stopped manufacturing that model and I could not find a replacement. Anyway, my understanding about the holes is so that the shovel can be held by a couple of nails on the side of a cabin – suspended above the ground/snow. Even if that wasn’t the original idea, they are certainly useful for this purpose! Paul, mine has a black blade, but it it pretty old. I’m guessing one of their first models. I checked the blade edge and didn’t find a “V” edge, but did find a pretty banged up edge. I took a file to it to give it a bit more cut. I probably wouldn’t have looked at that if not for your article. Thanks for that. Too bad about your old shovel getting wrecked. It’s amazing what some folks use for common sense. Hopefully he didn’t borrow your axe! Great article Paul thanks ,I carry one snowmobiling all the time ,and will take along on some day hikes and try out , I found a blade in a mountain creek one day and took it to a winter camp I take the kids to ,it really is a nice tool too have around, As above just cut a green handle and attached . thanks again enjoyed as always, take care . It’s good to hear from you. Yeah, a shovel can be really very useful when snowmobiling, if not a life-saver. I use the venerable old Rottefella shovel. A bit short handle, but one can easilly make a longer one if one wants. And the curve is nice when digging out cave style shelters. Yes, good shovels – the one with the wooden handle, right? Listened to podcast No 6 which was very interesting and it was lovely to hear from an elder of the Sami people. With reference to the snow shovel. Do you know what the four holes on the blade are for? Most metal blades seem to have them and I’m sure they are there for a reason, any ideas? Yes the holes can be used to attach the shovel blade to a set of skis to create an improvised sled/stretcher for removing a casualty, particularly in the mountains. Oh dear I just read the earlier comments regarding the holes! I thought perhaps it was something more technical.